Born: 1810 Arnhem, The Netherlands. Died: 1883 Arnhem, The Netherlands. Bernard Hendrik Everts was born in Arnhem in 1810. 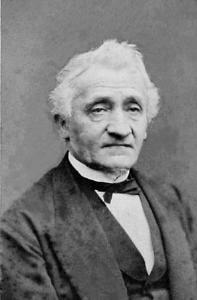 He began studying medicine in 1829 at the University of Leiden and obtained a degree in 1834. In 1840 he was appointed as a psychiatric doctor at Deventer’s St. Elisabethgasthuis, considered at that time to be one of the most modern and advanced of its kind, and one of the first institutions certified as compliant with the Netherlands’ insanity legislation in 1841. Everts remained associated with St. Elisabethgasthuis until 1846. Although appointed as a doctor, his daily work also involved administrative duties, not least because he was one of only two members of the institution’s board of directors. Later on, the board of directors was expanded to three members, which allowed Everts more time for his medical duties. Throughout the period of his appointment, Everts was obliged to supplement his income by engaging in local private practice, and disappointment at not securing full-time clinical duties probably contributed to his decision to leave St. Elisabethgasthuis in 1846. In 1847, Everts was appointed as the senior medical officer of the Meerenberg institution in Noord-Holland. This institution, which was still under construction at the time of his appointment, was the first modern mental healthcare institution ever built in the Netherlands. Everts was appointed on the recommendation of the most important Dutch psychiatrist of that time, Schroeder van der Kolk. Through his work at Meerenberg, Dr. Everts was himself to become renowned as a psychiatrist throughout the Netherlands. In 1847 and 1848, he was involved in the construction of the institution, making study trips to Germany in 1847 and to England and Scotland in 1848. (His original intention was to tour Belgium and France as well, but it is not known whether he actually did so.) Dr. Van Leeuwen, Meerenberg’s junior physician, joined Everts on the second of these journeys. During the trip, both doctors were extremely impressed by the policies of non-restraint they saw in operation in many of the institutions they visited. As soon as Meerenberg opened, both men began to introduce treatment by non-restraint into the institution. Extremely disruptive patients were placed in isolation, rather than in straitjackets, to calm down. Techniques of ‘moral management’ complemented this policy of non-restraint. These focussed on increasing the amount of self-control a patient had through work education and religious practice, and generally induced more humane treatment of the mentally ill. Despite problems caused by the overcrowding of Meerenberg, Everts remained a staunch advocate of non-restraint. However, not everyone agreed with the measures he took in treating patients. Between 1851 and 1869 he was criticized on several occasions by the Netherlands’ national inspection regime. According to the inspectors, the use of isolation cells was an unnecessarily extreme measure, and actually less humane than the forcible restraint of patients because it removed them from the company of others for long periods. Everts was a practical man and devoted most of his energy to establishing Meerenberg. Besides his annual reports on Meerenberg, he rarely went into print. One exception was an article he and van Leeuwen wrote for the Nederlandsch Lancet in 1852 on the advantages and disadvantages of English approaches to psychiatric treatment, based on the journey the two doctors had made in 1847, as well as on two further visits separately undertaken by van Leeuwen. In 1873, Everts retired as medical director of Meerenberg, and was subsequently awarded a state pension for his service to society. He returned to live in Arnhem, the town of his birth, where he died in 1883.